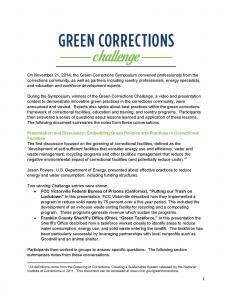 The NIC Green Corrections Initiative seeks to increase awareness among corrections professionals about environmental issues related to the practice of corrections and focus attention on the need to make correctional facilities more energy and resource efficient. 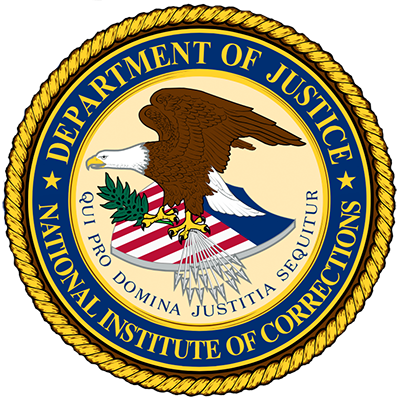 The initiative also explores the feasibility of introducing green-collar job readiness training programs in facilities, assessing the capability of correctional industries to adopt ”green” practices, and identifying strategies to assess cost saving options for correctional agencies that operate self-sustaining facilities and programs. 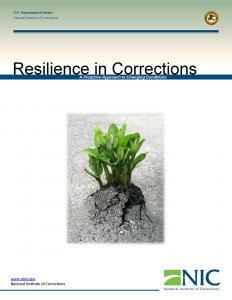 The NIC publication, The Greening of Corrections: Creating a Sustainable System, provides a background for this initiative and highlights four main recommendations for the greening of prisons and jails. 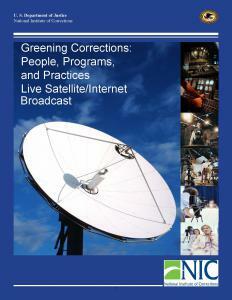 The initial scope of the NIC Green Corrections Initiative included provision of technical assistance support for three states: Minnesota, Washington, and Maryland. These states worked to develop strategic plans for implementing or improving green corrections programs in their local area. A summary of the technical assistance results can be found in The Green Corrections Project: Action Plans and Lessons Learned. Project outcomes also included the creation of a community of practice to promote the use of green practices throughout country. From the community of practice and strategic plans, a framework for green corrections will be created and shared nationally.